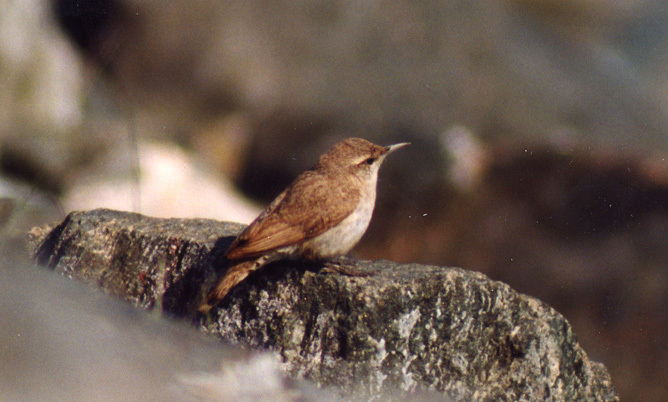 This poorly photographed Rock Wren was actually quite cooperative, perching and even singing among the rocks of a small causeway in Port aux Basques. It is the only record for Newfoundland and one of very few in the east. Origins: Occurs in western North America, from southern Alberta and Saskatchewan to Mexico – generally in arid or semi-arid areas with pleny of rocky outcrops. Only the northern part of the population is migratory, with very few records in the east. Record Details: One (very unexpected) record for Newfoundland – a singing bird reported from Port aux Basques by visiting birders and seen by a handful of others on July 3-4, 2004.